- Welcome to the world of PENsive: from the mind and pen of Artist Damon Kardon. This is a weekly editorial cartoon satirizing the social ills of our time, especially what Damon finds most perplexing in the music/arts, social media and political industries. - I had been following the plight of Meek Mill when it was just a Philadelphia story of a broken judicial system. It gained national headlines (as it should) when everyone from the Super Bowl-winning Philadelphia Eagles to Jay-Z shined a light on Meek’s case. The most comprehensive account of what happened to him (that I read) was in Rolling Stone Magazine a few months ago, and I was so angry after reading the article. Check out the full-resolution version of the PENsive #3 sketch. 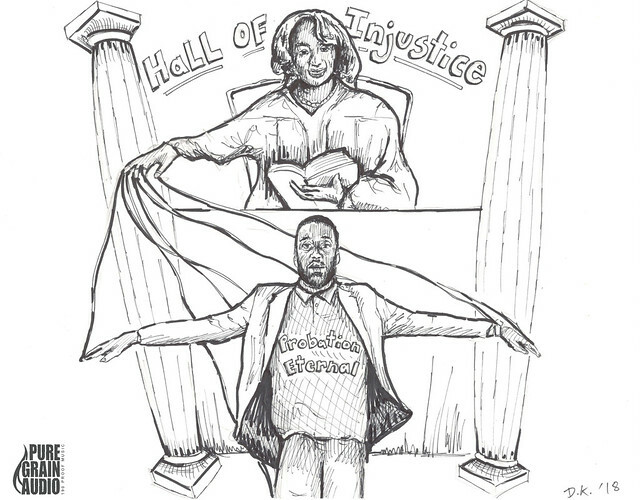 Philadelphia Judge Genece Brinkley has had Meek Mill under her thumb since his Juvenile court case stemming from a drug charge brought on by a (now-proven) corrupt cop. She has made every decision since that verdict in regards to his probation, making it next to impossible for him to comply and make a living as an artist. The worst of all was her sending Meek to jail over a probation violation for riding a dirt bike. He should have never gone to jail the first time, and now that all the facts of this prior police corruption came to light, he has been released. Check out this dope “Stay Woke” police brutality-related performance from the 2018 BET Awards.